A second man has been charged in the weekend shooting at an art festival in Trenton that injured 22 people and left one man dead, authorities said Tuesday. Davone White, 26, of Trenton, has been charged with weapons offenses in the Art All Night festival shooting early Sunday. Davone White, 26, of Trenton, is charged with unlawful possession of a weapon and a large capacity magazine that could hold 30 rounds, Mercer County Prosecutor Angelo Onofri announced at a news conference. He said White was involved in the shooting early Sunday at the Art All Night event at Roebling Wire Works, terrifying festival-goers who scrambled for safety when the bullets rang out. White remained hospitalized Tuesday in stable condition with gunshot injuries. Dozens of religious leaders who serve as police chaplains were among the attendees at the community meeting and pledged to help support law enforcement to curb violence like the weekend shooting, which put the state capital in national headlines. The chaplains are typically dispatched when there is a police shooting or tragedy to comfort families and police. Police chaplains were among those who met with law enforcement officials Tuesday at Friendship Baptist Church in Trenton to discuss recent violence in the city. "We will not accept our city being turned upside down," the Rev. John Taylor, the church's pastor, said, drawing a chorus of "Amen." "This is a time when we need to heal." Shortly after the news conference, Casey DeBlasio, a spokeswoman for Onofri, disclosed that four officers involved in the fatal shooting had been placed on paid administrative leave. The investigation will review whether the use of deadly force was justified. A New Jersey Department of Corrections photo shows Tahaij Wells, 32, who was killed in a shooting Sunday at the Art All Night event in Trenton. It was unclear Tuesday how White was connected to Tahaij Wells, 32, a suspected gunman and a member of the 93 Gangsters' Bloods gang, who was fatally shot by police Sunday, and Amir Armstrong, 23, who also remained hospitalized in critical but stable condition and faces firearms charges in connection with the festival shooting. Investigators believe the shooting stemmed from tension between neighborhood gangs. Wells and the two suspects in custody were affiliated with gangs, but he could not say whether they were members of the same gang. "We're not really experiencing the Bloods and the Crips anymore," the prosecutor said. "It is a neighborhood-by-neighborhood gang affiliation. I think that a lot of the shootings that we are seeing in the city are retaliations for previous shootings." Authorities say a Facebook message posted Saturday afternoon warned of a possible disturbance at the festival, which typically draws up to 30,000 people. Mayor-elect Reed Gusciora and other officials have said they were aware of the social media posting. Onofri said investigators have traced the message to a Hamilton Township teacher believed to have posted it around 12:30 p.m., more than 12 hours before violence erupted. The woman, whom he did not identify, was in North Carolina on vacation at the time, he said. "Please. Please. Please. Do Not Go to the Art All Night," the message said. "They will be shooting it up." Onofri said investigators are trying to determine how the woman may have learned about a possible shoot-out at the event. Investigators contacted the woman by Skype and planned to interview her Tuesday, but the woman has since retained a lawyer, the prosecutor said. It was unclear if the interview went forward as planned. State Attorney General Gurbir S. Grewal, who addressed the crowd of about 100 people, said law enforcement must continue to build trust in the communities to help prevent violence such as the gang-related tension that erupted in a shoot-out at the normally placid art festival on the 600 block of South Clinton Avenue. New Jersey, which recently enacted tougher gun laws, will push to keep illegally obtained weapons out of the state, he said. "We have been doing our part," Grewal told reporters. "Unfortunately today we are brought together by a horrific event." About 1,000 people were at the show when bullets began to fly, sending festival-goers into a panic as they fled in fear. When the shooting stopped, authorities say, 17 people had been wounded, and at least five were injured in the rush to get away from the melee. It remained unclear Tuesday whether police officers had shot some of those who were injured Sunday. The prosecutor declined to reveal how many rounds were fired, or how many times Wells was struck. Details about the officers' rank or tenure were not released. 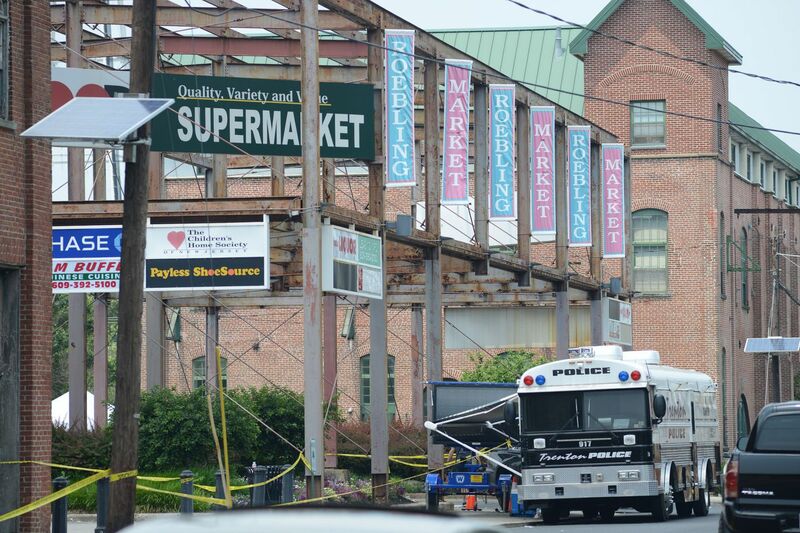 Mercer County Prosecutor Angelo Onofri on Tuesday announced charges against a third suspect in a weekend shooting at a Trenton arts festival that left 22 injured and a suspected gunman dead. "It will be released in due course," the prosecutor said. Wells was released from prison in February after serving time in connection with a fatal shooting committed when he was 17. Even while behind bars, he remained involved with the Bloods and helped run the gang from prison. The prosecutor left open the possibility Tuesday that additional charges may be filed. Police are still investigating an attempted carjacking that occurred around the time of the shooting to determine whether it was connected to the shooting, he said. Onofri said investigators are still reviewing video surveillance footage from the venue and collecting ballistic evidence that may help determine which bullets struck the bystanders. That footage may be released soon, he said. He also said Armstrong will face an additional charge of possession of a stolen weapon in 2013. No other details were released about the incident involving that charge. At the news conference Tuesday, officials vowed to keep sponsoring the 24-hour annual arts festival that attracts visual artists, short films and a diverse range of live music groups. The free event has been touted as the cornerstone of the city's artistic revitalization. "We will make this event bigger, brighter and better," Mayor Eric Jackson said. "We are a resilient city." Community and faith-based leaders met with law enforcement officials Tuesday at Friendship Baptist Church in Trenton to discuss recent violence in the city.